We like our fans, well actually, we LOVE our fans. We are a small, independent cosmetics company that understands and values the importance of each and every one of our customers. Zoya views our fans as ambassadors of our products. Your dedication and feedback via our social media outlets has helped shape us into the successful company we are today. We continue to grow with your input and support. During this holiday season we would like to show you our appreciation with an incredible offer to start off the new year. Please, allow us to share our wonderful nail polish and treatment products with your like-minded friends! 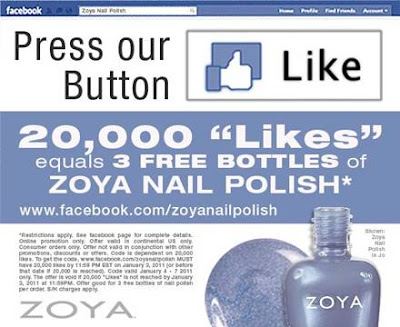 We are hoping for 20,000 "Likes" on facebook by January 3, 2011, and if we get them, we will provide a code for 3 free bottles* of Zoya Nail Polish to all fans and followers in the Continental US. Yes, we love our international followers too but due to international regulations and restrictions we can only offer this promotion domestically at this time. “Like” ZOYA on facebook and make 2011 a year of nail polished perfection. Not already following ZOYA on facebook? Do you love nail polish? Then you should follow Zoya for daily updates, promotions and fun on facebook! Simply go to www.facebook.com/zoyanailpolish and press "Like"! With over 300 colors and treatments to choose from, there is always something for you and your fellow nail polish lovers to talk about. While you are at it, make sure to spread the word about Zoya to all of your friends. Already following ZOYA on facebook? You "Like" us - we LOVE you! You already know about the great giveaways and promotions we do! Don't keep Zoya to yourself! Spread the word! To help reach the 20,000 tell 4 friends (or more!) to like Zoya! ...or sooner, when we hit the magic number of 20,000, Zoya will release the 3 FREE BOTTLES of Zoya Nail Polish code on facebook. I refuse to "like" or enter anything that is restricted to US people only. Sorry Zoya! Alaska and Hawaii are states too! too bad its restricted to us only, but hey, i already gave a like to Zoya because well, i like Zoya!